Collins Vumiria discovers why Uganda’s traditional birth attendants are being sidelined in the fight against HIV. Earlier this month I asked Uganda’s minister of state in charge of primary health care, Dr Emmanuel Otaala, why traditional birth attendants – who deliver tens of thousands of babies each year – seem to play little part in HIV awareness and prevention or in the prevention of mother-to-child transmission of the virus. It had been on my mind since I met an experienced traditional birth attendant (TBA) who told me she last attended a workshop on HIV counselling in 1992. Hasifa Nalwoga Ssenkayo is 52 years old and with two years of schooling behind her has been working as a birth attendant since 1976. A mother of ten, Hasifa’s workplace has 14 make-shift beds. She operates in a crude environment where everything is improvised. She knows something about HIV and advises women to go for HIV tests after she delivers their babies. But from her answers to some of my questions it was clear she was confused about how the virus could be diagnosed and would benefit from more training. In fact Hasifa had asked for just that. She told me she had been to the nearest general hospital looking for collaboration with the medical team to improve her services “but failed to get through”. The G8 has pledged extra funds for infectious diseases including HIV and AIDS. But a shortage of money is not the only barrier to HIV treatment. Fear, stigma and poverty are rife – and still claiming lives. Before coming to Germany, Zinhle Mapumulo visited one of many villages in South Africa where few are willing to discover their HIV status. Mmabo Lefatshe looks petite, but in her village of Mazista - in South Africa’s North West Province - she is a well-respected and strong woman. I’ve visited a number of the country’s rural areas, but none compares to Mazista; the affluence you find in some parts simply hasn’t touched this corner of the country. The first thing I see when I enter the village is a cluster of about a hundred shacks squashed into a site suitable for ten or so houses. A few metres away a squatter camp doubles as a dumping ground for rubbish. 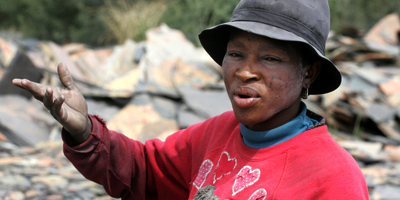 Deeper into the village is Lefatshe’s house which belongs to the mining company she works for. Lefatshe (39), Steve Modise (27), and Catherine Moya (51), were the first three people to disclose their HIV status in Mazista when the virus dared not speak its name. Many villagers called for them to be expelled, saying they had shamed the community by bringing this 'curse'. Today the same people who were calling for Lefatshe and her counterparts to be banned are seeking advice from her on how to live with the HIV virus. When she was ten years old her teacher raped her. At 14 her closest confidante, her church pastor, raped her. Now she is a mother, and she lives with HIV acquired during her marriage. The South African AIDS activist Nhkensani Mavasa rocked the G8 Alternative Summit with her moving story. When I heard her outspoken account of her life, a shiver ran down my spine. These traumatic incidents are daily realities in Africa. In some villages in Uganda, father-in-laws consider it a right to force themselves on their daughter-in-laws. Many women I know try to avoid acquiring HIV during their marriages by planning to leave the relationship as soon as they have a child – and while they’re still alive - rather than trust their husband to be faithful. So I wonder whether we have simply learned to live with these violations. In some African cultures women are not allowed to speak out whether one is raped or not. It is supposed to remain a secret because it’s taboo to shame a man. But now Nhkensani is making it her mission to tell other women that such silence could kill them. “Now that I have seen some light, I want to take this light to all the women down there who are suffering and the children who are being defiled day and night and have to keep quiet," she says. Who's really listening to African women’s voices? One of the AfricaVox journalists, Zinhle Mapumulo, has been interviewed for openSummit, a blog covering the G8 process from a woman’s perspective. 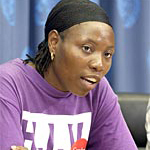 "As a woman, I feel there’s never any in-depth coverage of women: I want to know how do the G8 contributions, how do their pledges benefit me and my 2 year-old daughter..."
This blog was written by a team of African journalists, who worked with Panos London to report from the 2007 G8 Summit in Germany. What news do I take home for my people?